In August, 464,700 people received regular Employment Insurance (EI) benefits, down 7,400 (-1.6%) from the previous month. The number of beneficiaries fell in the majority of provinces, with the largest percentage declines in Prince Edward Island (-4.5%), Alberta (-3.7%), Quebec (-2.6%), Newfoundland and Labrador (-2.5%), Manitoba (-2.2%) and Nova Scotia (-1.3%). There was little change in Ontario. 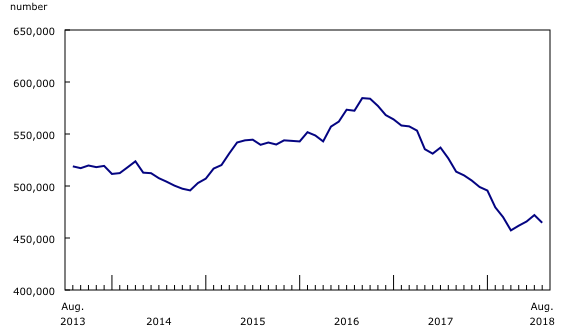 Compared with August 2017, the number of EI recipients in Canada declined by 61,900 (-11.8%). In general, variations in the number of beneficiaries can reflect changes in the circumstances of a number of different groups, including those becoming beneficiaries, those going back to work, those exhausting their regular benefits, and those no longer receiving benefits for other reasons. In Prince Edward Island, the number of EI recipients declined by 4.5% in August to 7,600, offsetting the increase in July. Declines were observed across most of the province. Compared with August 2017, the number of beneficiaries fell by 2.6%. 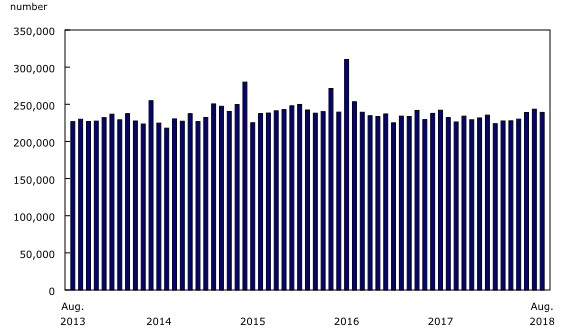 There were 52,300 people receiving EI benefits in Alberta in August, down 3.7% from July and continuing the downward trend that began in the fall of 2016. In August, the number of beneficiaries decreased the most in the census metropolitan area (CMA) of Edmonton, falling by 5.0% to 19,600. In the 12 months to August, Alberta continued to have the fastest year-over-year decline among the provinces, with the number of recipients down 23.0%. Data from the Labour Force Survey (LFS) report that the unemployment rate for the province fell from 8.1% to 6.7% over this period. In Quebec, the number of beneficiaries fell by 2.6% to 117,000, following three consecutive monthly increases. There were fewer recipients in three of the six CMAs, including Saguenay (-8.3%), Québec (-6.4%) and Trois-Rivières (-3.6%). In the 12 months to August, the number of beneficiaries in the province fell by 10.8%. Over the same period, the provincial unemployment rate, as reported by the LFS, decreased by 0.4 percentage points to 5.6%. The number of people receiving EI benefits in Newfoundland and Labrador was down 2.5% in August to 34,900. This decline continued the downward trend that began at the end of 2017. On a year-over-year basis, the number of EI recipients fell by 10.2%. Despite fewer EI recipients, the unemployment rate, as reported by the LFS, was little changed over the period. In August, the number of EI recipients in Manitoba fell by 2.2% to 15,700. There were fewer beneficiaries in areas outside the CMA and census agglomerations (CAs) (-2.5%), and in the CMA of Winnipeg (-2.0%). In the 12 months to August, the number of people receiving benefits in Manitoba was little changed. The number of people in Nova Scotia who received EI benefits in August declined by 1.3% to 26,900. There were 2.2% fewer recipients in the Halifax CMA and in the CA of Cape Breton. Compared with August 2017, Nova Scotia had 3.5% fewer beneficiaries. In Ontario, the number of EI beneficiaries was virtually unchanged in August at 120,400. Among the CMAs, the largest percentage increases were in Guelph (+6.5%) and Oshawa (+6.2%). The Toronto CMA posted a 2.2% increase. In contrast, there were declines in London (-4.1%), Windsor (-3.9%) and the CMA of Ottawa–Gatineau (Ontario part) (-2.5%). On a year-over-year basis, the number of recipients in the province fell by 10.1%. Over the same period, the LFS reported employment growth of 1.1% in the province. Compared with 12 months earlier, the number of EI beneficiaries decreased in all 10 broad occupational groups in August. 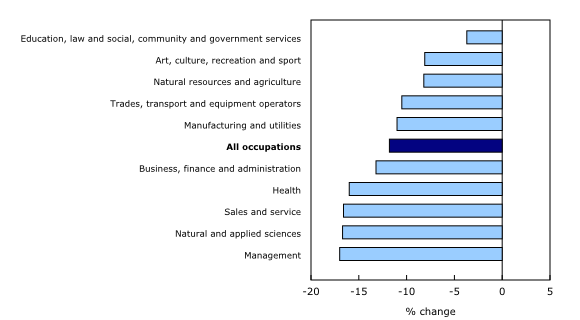 Those whose last job was in management led the declines (-17.0%), followed closely by occupations in natural and applied sciences (-16.7%) and occupations in sales and service (-16.6%). There were 239,100 claims in August, down 1.8% from July. The number of claims provides an indication of the number of people who could become beneficiaries. 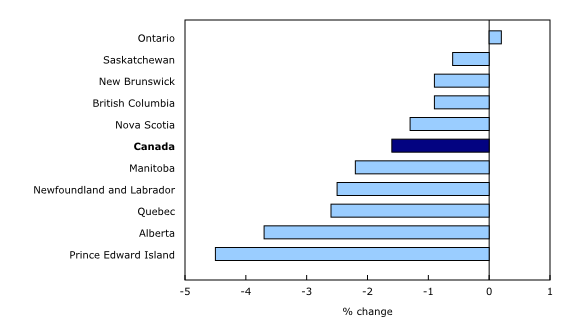 Prince Edward Island (-11.1%) and Alberta (-7.9%) recorded the largest percentage declines, followed by Quebec (-3.6%), Saskatchewan (-3.4%) and Manitoba (-2.3%). In contrast, there were more claims in Nova Scotia (+2.4%) and Ontario (+1.2%). There was little change in the other provinces. In the 12 months to August, the number of claims increased by 3.0% at the national level. Regular EI benefits are available to eligible individuals who lose their jobs and who are available for and able to work, but cannot find a job. To receive EI benefits, individuals must first submit a claim. The number of beneficiaries is a measure of all people who received EI benefits from August 12 to 18. This period coincides with the reference week of the LFS. However, claims data are for the entire month. A census metropolitan area (CMA) or a census agglomeration (CA) is formed by one or more adjacent municipalities centred on a population centre. A CMA must have a total population of at least 100,000. A CA must have a population of at least 10,000. See Standard Geographical Classification 2011 – definitions for more information. Data on Employment Insurance for September will be released on November 22. More information about the concepts and use of Employment Insurance statistics is available online in an updated version of the Guide to Employment Insurance Statistics (Catalogue number73-506-G). To enquire about the concepts, methods or data quality of this release, contact Vincent Ferrao (613-951-4750; vincent.ferrao@canada.ca) or Client Services (toll free: 1-866-873-8788; statcan.labour-travail.statcan@canada.ca), Labour Statistics Division.